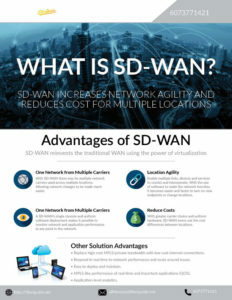 For enterprise IT managers requiring more flexible, open, secure and cloud-based wide area networking instead of specialized Wide Area Network (WAN) technologies, SD-WAN is the best option. FiberGuide is a one stop shop for SD-WAN solutions from multiple providers. Contact us or visit our GeoQuote page to request a list of providers and pricing plans that meet your requirements. You may also contact us to arrange a demonstration. Area Networks (WAN). It moves the control of the network from hardware to the cloud, thereby simplifying and centralizing network management. SD-WAN is an extension of software defined networking (SDN) and is used to automate the management of wide area networks. SDN is a network management approach that separates the control plane (the logic deciding how to handle traffic) from the data plane which forwards the traffic. SD-WAN also comes with security that makes wide area networking over the Internet significantly more secure. There is an ongoing debate on whether enterprises should abandon the relatively costly MPLS networks and migrate completely to SD-WAN using the inexpensive public Internet. While many have taken full advantage of the SD-WAN innovation, most enterprises still insist on using private network paths at least for the most sensitive of their traffic. Today’s wide area networks employ SD-WAN to support the ever-increasing number of enterprise applications. In traditional WAN, when-ever there are constraints in the network, the solution is to increase bandwidth. With SD-WAN, network constraints can be addressed by prioritizing mission critical applications using hybrid WAN. Hybrid WAN is usually associated with but is not identical to SD-WAN.